Pancrezyme powder is a prescription only product that contains pancreatic enzymes, and this product is prescribed for dogs who suffer from maldigestion syndrome or whose bodies do not produce needed quantities of pancreatic enzymes on their own and need a supplemental dose. Pancreatitis in dogs may require enzyme supplements, and this is true of Pancreatic Insufficiency Disorder as well. If your pet has a problem with pancreas function or enzyme production then weight loss can occur because digestion is not effective. Pancrezyme powder may be prescribed to help restore any lost weight, and improve the ability of your pet to digest food normally. The sick dog symptoms that may be caused by pancreatic enzyme problems can be resolved when these enzymes are supplemented. Without a sufficient quantity of the enzymes Lipase, Protease, and Amylase your pet can not digest food properly, and may experience a number of symptoms including weight loss and pain. Pancrezyme powder can resolve any enzyme deficiency, so your dog can digest food more effectively and will stay healthy and symptom free. This supplement will not treat elevated liver enzymes in dogs, or any liver enzyme deficiency. There are very few possible side effects with this product, and when side effects occur it is typically because an overdose was accidentally given. 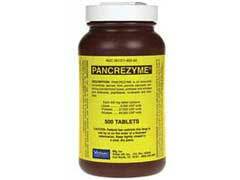 The possible side effects of Pancrezyme powder can include diarrhea if too much of this product is given to your pet. An allergic reaction is also a possibility, and this supplement should not be given to any animal allergic to pork. The powder is manufactured using whole pig pancreas in a raw state, and can cause problems to any cat or dog allergic to pork products. If a canine liver disease diet is also followed then your vet should be consulted, to ensure your pet’s diet is sufficient. Other side effects that may occur with this supplement include stools which are excessively fatty and a weight gain.